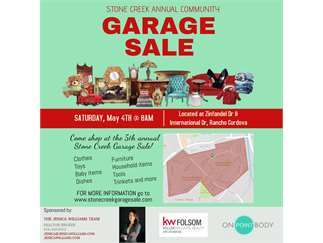 Come out to the Stone Creek 5th Annual Community Garage Sale, located in the Stone Creek neighborhood in Rancho Cordova! Clothes, furniture, toys, tools, trinkets, and more! Check out our website for a list of items being sold, a neighborhood map, tips and tricks for garage sale shopping, and other updates!